For all my life, one of the ways that Republicans use to describe themselves is, as the party of financial conservatism. Currently, we have conservatives in control of all branches of government. So one would think that while they are in control of the government they would implement policies that reduce the national dept and deficit spending. Yet, with the dept over $21, 000,000,000,000 dollars they just passed a budget that increased spending. And the Republicans passed a tax bill that reduces taxes by paying for in with an increase in deficit spending. So, how is the party of fiscal conservatives now the party of big spending and increased dept? According the the Associated Press (An actual news organization) and even Fox psudo-news, a CBO report the tax cuts they just passed will increase the nation's $21 trillion debt would spike to more than $33 trillion in 10 years. According to the report, "GOP tax bill, which is Republican-controlled Washington's signature accomplishment under Trump, will add $1.8 trillion to the deficit over the coming decade, even after its positive effects on the economy are factored in" Which to me, doesn't seem like good fiscal policy for a political party that claims to care about that. Now to the $1.3 trillion Spending Bill that the Republicans just passed for the year. We have $1.6 billion for border security which includes money for the border wall with Mexico that the US is paying for. Not to mention the $25 billion that Trump wants for the wall. They increased military spending another $164 billion over the next two years. 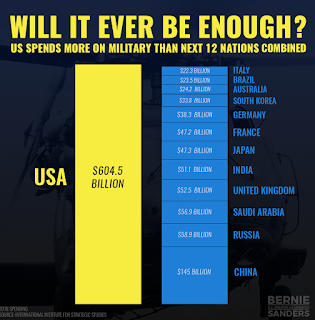 Because the $604 billion we already spend on the military industrial complex wasn't enough.